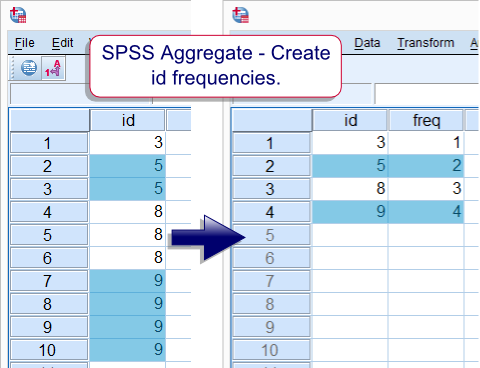 Aggregate is an SPSS command for creating variables holding statistics over cases. This tutorials briefly demonstrates the most common scenarios and points out some best practices. One or more BREAK variables can be specified.In SPSS versions 15 and below, specifying at least one BREAK variable is mandatory. If you want statistics over all cases, use compute constant = 0. and use constant as the BREAK variable. 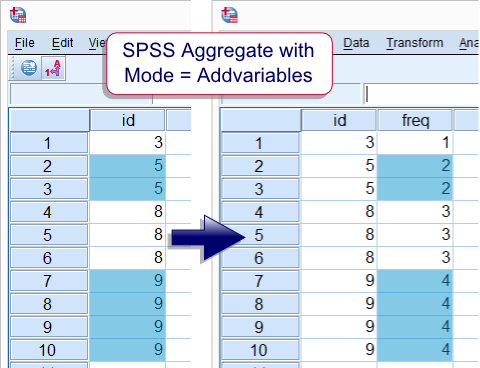 Each break group will become a single case in the aggregated data (unless MODE = ADDVARIABLES is used). This new case has summary statistics over the original cases as new variables. Available statistics include the frequency, mean, maximum and many others. Consult the command syntax reference for a complete overview. The result of AGGREGATE may be the active dataset, a new dataset or a new data file. (This last option is not available for MODE = ADDVARIABLES.) A new Dataset must first be declared before it can be specified in AGGREGATE. For a very basic demonstration, run the syntax below. *2. Create Dataset with id counts (called 'freq' for 'frequency'). Except for SPSS versions 12 and below, summary statistics of break groups can be appended to a Dataset without actually aggregating it. The syntax below demonstrates this. *Append id counts to Dataset. Summary statistics can be rendered over multiple variables in one go. The TO and ALL keywords can conveniently shorten the list of variables as shown in the syntax below. *2. Aggregate multiple variables at once. /mean_1 to mean_5 = mean(v1 to v5). Different summary statistics (over the same or different variables) can be specified in a single command. This is demonstrated below (uses test data from previous example). * Different summary statistics in a single command. /sd_1 to sd_5 = sd(v1 to v5). Lots of different things can be done with the AGGREGATE command. This tutorial aimed at illustrating the most common scenarios found in practice. It is by no means intended as an exhaustive overview of all options.